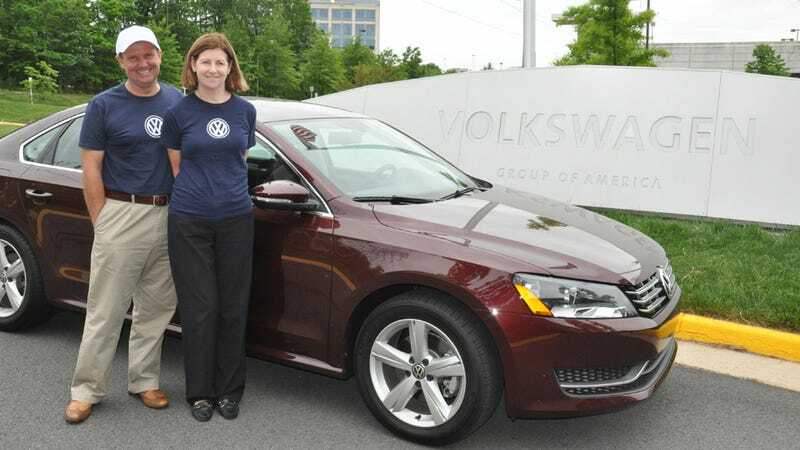 Averaging 84.1 miles per gallon, John and Helen Taylor drove a stock, manual 2012 Passat TDI from Houston, TX to Sterling, VA on one tank of diesel. It took them three days and 1,626.1 miles, but they set a new fuel economy world record. Specifically, they broke the record for the longest distance on one tank of clean diesel fuel by 99.5 miles, previously held by a European diesel Passat. The Taylors already hold numerous world driving records, and they didn't do any modifications to boost their mileage. They drove in 14-hour stretches, sticking to regular daytime traffic. They also had 120 pounds of luggage in the car. Meanwhile, diesels accounted for a a fifth of all US Passat sales in March, and nearly a quarter of all of Volkswagen USA's sales were TDIs for the first quarter of 2012. Maybe American buyers are finding out that you don't have to buy a Prius after all.